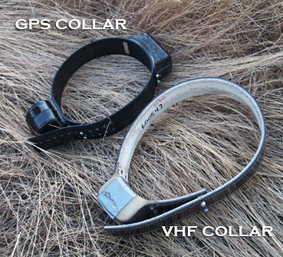 LWL use two types of collars to monitor lions: VHF collars and GPS collars. Most of our lions have VHF collars, which transmit a radio signal, which can be picked up with a hand-held receiver connected to a directional antenna. The newer (and more expensive) type is a GPS collar, and LWL currently have 10 of these deployed. GPS collars have fundamentally changed the way that lion research is done, in that we are able to study lion movements in great detail in areas where it is usually impossible to follow them. The technological developments in the collar components in the last few years have meant that they are more reliable than they were, they last for longer and can do more. Specialised, very tough belting material and electronics housing made from advanced plastics and epoxy. A Lithium-ion battery pack, designed to last for at least 18 months, operating continuously. A Global Positioning System (GPS) unit that calculates the exact hourly location of the collar, every hour of the night. A memory that stores the location information on the collar. An Iridium satellite transceiver that is used to send or receive data. A VHF radio “beacon” that emits a radio pulse, for use with traditional telemetry equipment. A dedicated server that receives data from the collar in the form of text messages, and translates them into an email format. Fieldworker searches for the radio signal from the collar, then records a location on a handheld GPS. Collar sends its location data to fieldworker by email. Fieldworker discovers a faster radio pulse if lion has not moved for more than 4 hours. Collar sends an email (mortality alert) that the collar is stationary. 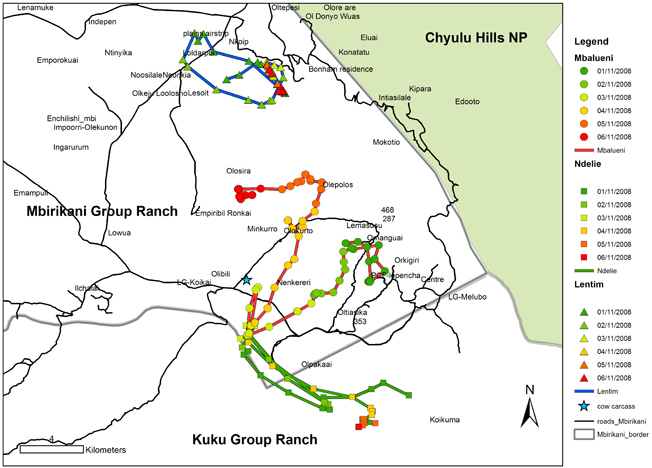 The emailed location data can be used to guide the work of the Lion Guardians, and to produce distribution maps for collaborators in the ecosystem, like the one below. Our colleague Mike Calvin has constructed a novel website where the KLCP lions with GPS collars can be tracked online. Only the generosity of our sponsors allows us to use this extraordinarily informative technology.